Crazy May Days: There is a bear in my bed. Now I ask you- what kind of acrobatics do you have to do in your sleep for your arm to completely come out of your jammies? need another look? 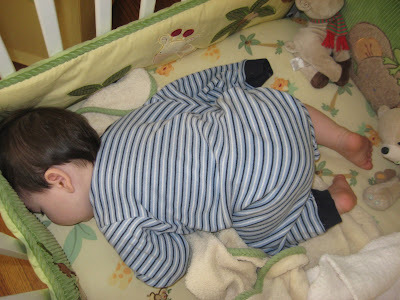 I really posted both pictures because I know that you like to look at sleeping babies too. We have decided that the only logical explanation is that a bear must live in Gabe's bed and he obviously wrestles with it each night before he tuckers out. Our Gabe is a silly ole' bear. Cute! 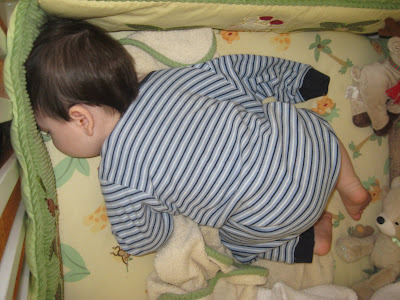 I am always amazed at the things kids do, and the positions they get themselves into when sleeping!